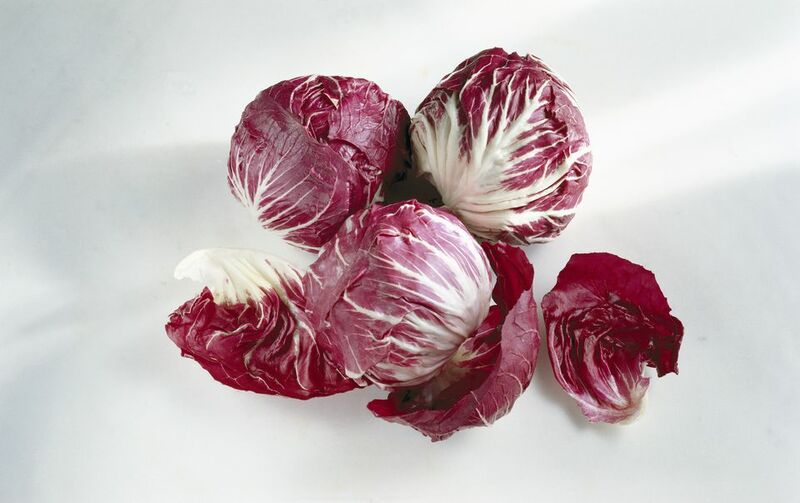 That gorgeous color that makes radicchio so beautiful comes along with a famously bitter edge. People tend to either love or hate that distinctive flavor. For those who find it compelling but a bit much, know that sautéeing radicchio tempers the bitterness beautifully (as does grilling). Satuéed radicchio may be simple, but it's full of flavor, has a pleasing toothsome texture even when fully cooked, and makes an excellent side dish for rich dishes. Try it alongside beef roasts or stews. It's also mighty tasty with a well seasoned roast chicken. Trim off and discard any brown part of the stem end of the radicchio. If the outside leaves look a bit beat up, feel free to remove and discard those as well. Cut the radicchio head into quarters, cut out and discard the core from each quarter, and cut the quarters into bite-size pieces. To keep things as pretty as possible, consider leaving the pieces fairly large. Heat a large frying pan or saute pan over medium-high heat. Add the oil. Swirl the to coat the bottom. Add the radicchio, sprinkle with salt, and stir to coat the leaves with the oil. Cook, stirring frequently until the radicchio is tender to the bite and starting to brown just a bit, about 8 minutes. Transfer the radicchio to a serving platter or individual plates. Sprinkle with more salt to taste, if you like. Serve hot, warm, or at room temperature. Before adding the radicchio, toss a thinly sliced or roughly chopped clove of garlic in the pan. Stir and add the radicchio immediately or, for a more distinctive flavor, let the garlic turn golden before adding the radicchio. Counter the bitterness by slowly caramelizing a sliced shallot or two over medium-low heat before sautéeing the radicchio. Add a sprinkle of fresh herbs—a chiffonade of basil or some chopped rosemary or simply a few parsley leaves—before serving for a burst of light, vibrant flavor against the strong taste of the radicchio. Brown about 1 ounce of finely chopped pancetta or bacon in the oil before adding radicchio to the pan for a meaty undertone to the dish (it's an easy way to get people to try a vegetable: add bacon). Tame the bitterness of radicchio even more by mixing it with some kale, essentially diluting the flavor and adding the more familiar green color of leafy "greens." Drizzle the radicchio with some basil pesto or other herb sauce—the green makes it pretty and tasty. Create a bit of texture and top the radicchio with a sprinkle of toasted walnuts for a bitter contrast or pine nuts for a sweeter element. The strong flavor of radicchio can stand up to pungent cheeses—if you plan to serve it warm or at room temperature, try topping it with a few crumbles of blue cheese for a whole different flavor experience.